As we are enjoying our first bank holiday weekend of the year in England, eating hot cross buns, and looking forward to a four-day week ahead of us, I have been thinking about national holidays in China. Even If you are based in the West, you may increasingly have to deal with the Chinese calendar, as companies you work with suddenly shut up shop for “Tomb Sweeping” or “Double Nine”. The Chinese workforce don’t have the allotted number of days off that we call annual leave in the West. They have instead, a series of national holidays dotted throughout the year, which is the only official time off they get from work. Of course sick leave, or time needed off for emergencies such as childcare or looking after elderly relatives are accepted, and time for holidays can be arranged with an understanding lingdao (领导, an odd mix of second boss, shop steward, and government inspector, which is perculiar to the Chinese workplace). When I was at primary school in China twenty or so years ago, Saturday was a working day, and school day. I’m glad that’s changed now. But it still seems unfair that the Chinese have to work over the weekend before or after national holidays to “make up” for the days off during the week. 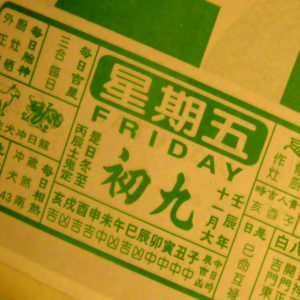 The first Chinese public holiday of the year is 1st January or 元旦 as it’s known in China, and the two days after it. For the Chinese the year’s first holiday season really kicks off with the grandmother of all celebrations, Chinese New Year, or Spring Festival, usually occurring around end of January, early February. This is the one that everyone knows about, with the lion dancing, feasting and temple visiting lasting until the 7th day of the new year, when many offices re-open. Some factories, which rely more on migrant workers, are closed until the 15th day, when Spring Festival is officially over. Next up on the festival calendar is, International Women’s Day on the eighth of March. In China, this is celebrated by giving its women half a day off. Qing Ming, also known as Tomb Sweeping Festival, falls on the 4th of April. The Chinese have three days’ holiday to remember their relatives who’ve passed away, clean their graves, and see in the Spring season with outdoor activities (see my article). For a country with a Communist past and many revolutions, May Day, is an important occasion. The Chinese have three days off, with parties and ceremonies held to remember past notables and bestow medals of honour on the 劳动模范 (“Lao Dong Muo Fan”) or Model Labourers in all fields and industries – the Communist equivalent of an OBE or CBE. June sees in the major traditional Chinese summer festival, Duan Wu, also known as Dragon Boat festival, occurring on the 5th of the 5th in the Lunar Calendar. The Chinese are given three days off to attend dragon boat races, eat Zhongzi and it’s traditional to wear certain herbs to ward off the summer germs . Another well known Chinese festival is the Moon Festival, or Mid-Autumn Festival. This is a Chinese traditional autumn celebration and harvest festival that occurs on the 15th of the 8th lunar month, which means September time in the Roman Calendar. The Chinese get three days off to eat moon cakes, appreciate the moon, and occasionally steal melons and baby shoes (I’ll have to go into that in a whole other article). Double Nine, or Chong Yang festival, is the Chinese festival for the elderly, It’s called Double Nine, as it occurs on the 9th of the 9th lunar month. This is a public holiday in Hong Kong, but just another work day in mainland China. About a decade ago, the Chinese started celebrating their National Day with Golden Week, occurring during the first week of October. With the slightly longer period off, workers tend to rush back to their home towns to visit family and friends. The rush on public transport is second only to the migrations around Spring festival! November and December seem to be a dreary time for the Chinese. There are no public holidays during this time but traditional festivities such as 冬至 (“Dong Zhi”) or Winter Solstice, 腊八 (“La Ba”) a winter festival of Buddhist origin, are celebrated in small ways by families. It’s also growing increasingly common for joint ventures, and Chinese companies dealing predominantly with Western customers, to also give their workers the 25th of December off, though Christmas is really a strange affair in China. Perhaps the leanness of celebrations in these winter months is good preperation for the overeating of Spring Festival, or maybe the cause of it. It’s a chicken and egg (and fish and pork and dumplings and sweets) situation. Here’s a list of dates for this year’s national holidays in China, hope you’ll find it useful.